Ladies, you are invited to our Annual Spring Tea! 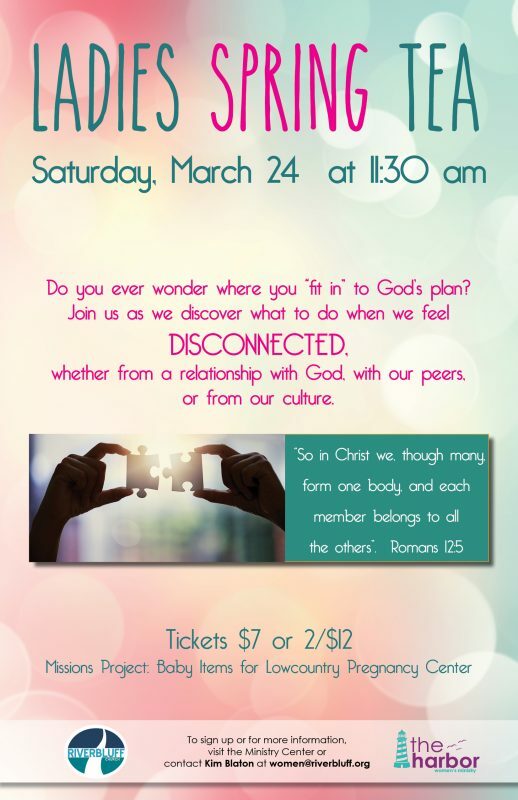 Tammy Feil will be speaking on Romans12:5 “So in Christ we, though many, form on body, and each member belongs to all the others”, and the idea of “fitting in” to God’s plan/place for us and what to do when we feel DISCONNECTED from that, whether it is disconnected from a relationship with God, with our peers, or our culture. Tickets are $7.00 each or 2 for $12.00, so bring a friend (or two). Tickets may be purchased on Sunday mornings in the Ministry Center or online at www.riverbluff.org/give (choose “Other” and designate Tea). We are collecting items for the Lowcountry Pregnancy Center again this year. Please bring baby items such as diapers, wipes, clothes, blankets, etc. to bless the families who are served at LPC!